If you find a wild animal exhibiting signs it needs help or a baby of the species listed below, call Willowbrook Wildlife Center at 630-942-6200. I Found a Wild Animal. What Should I Do? I Found a Baby Animal. What Should I Do? Find the information you need specific to one of these wild baby species. Never handle an adult animal without first consulting a wildlife professional. Even small animals can injure you! Once you've contacted a wildlife rehabilitator who can help, describe the animal and its physical condition as accurately as possible. Wear thick leather gloves and long sleeves when handling wildlife or gently use a tool — such as a broom or shovel, when possible — to move the animal. Cover the animal with a heavy towel to help avoid contact and keep the animal calm. Put the animal in a secure and safe container with good air flow. Shoe boxes, pet carriers, plastic food containers or cardboard boxes work well. Securely fasten the lid with duct tape. cup with tissue as an artificial nest for songbirds or raptors. 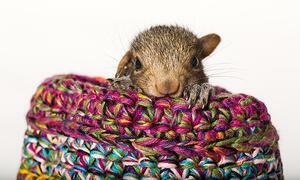 • For baby mammals, place a towel inside the container so the animals have a place to hide. • For adult animals, line the bottom of the container with a towel to absorb waste products, and cover the container with a large towel for darkness. Do not give the animal anything to eat or drink. It can choke or swallow improperly, leading to aspiration pneumonia. Babies are only fed by their parents; adults don't eat when scared and can be dangerous to approach. Most wild animals will not drink water from a cup, and leaving a water bowl with a young or debilitated animal could result in it drowning or a drop in its body temperature. Place the container in a warm, dark and quiet place — away from pets, children and all noise (including TV and radio) — until you transport the animal. Keep the container away from direct sunlight, air conditioning and heat. Transport the animal as soon as you are able. Leave the radio off and keep talking to a minimum. Keep the animal's space dark and quiet to limit its stress and help keep it alive. Do not peek at, talk to or interact with the animal in any way. It's always best for parents to raise their young in a natural environment. Unlike humans, songbirds and other young wild animals are not constantly supervised by their parents. They spend much of their time alone or with siblings. Because they learn how to find food and shelter, recognize their parents and avoid predators, people should leave them alone when possible. bleach any containers you wish to reuse. Do not allow pets near any wild animal. It’s illegal to keep wild animals for more than 24 hours. They have special nutritional, housing and handling needs, and inexperienced individuals who try to raise or treat them inevitably produce unhealthy, tame animals that can’t survive in the wild. If you are unable to make it to Willowbrook during normal business hours, call 630-942-6200 for a recorded message containing after-hours advice. The Forest Preserve District of DuPage County's Willowbrook Wildlife Center rehabilitates native wild animals. If our center cannot care for an animal, we offer information about other rehabilitators and resources.